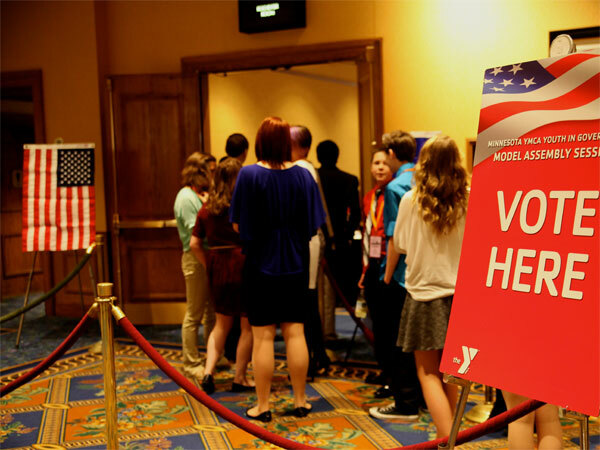 Minnesota YMCA Youth in Government is a youth-led, experiential learning opportunity that involves 2,500 middle-school and high school students each year. It is a nation-wide program, active in nearly 40 states. Across the country almost 25,000 students attend state Youth in Government conferences each year, with 3,300 adult volunteers and YMCA staff serving as advisors. Join youth leaders from around the state to debate issues that are important to you. Listen to delegates with different experiences. Research public issues and become aware of local, state, national and international concerns. Accept your civic responsibilities and your leadership role. Let your voice be heard and get involved in the decision-making process! Minnesota is among the top programs in the nation, both in terms of quality and number of students. 60% of participants and 55% of youth program leaders are female. Nearly two-thirds of all eligible students return the next year.